A free stay at ONE of our hotels / resorts at Langkawi Island, Tioman Island, Kuala Lumpur or Johor Bahru. Shoot a video and tell us "What Malaysia means to You" with maximum duration of 20 seconds. Submit both video and online registration form. Fill-in our online registration form and attach your video before clicking on the 'Submit' button. Once we have uploaded your video on pur page's timeline, do not forget to 'Share' it on yours. Videos can be uploaded in English, Malay or Chinese language, preferably English. 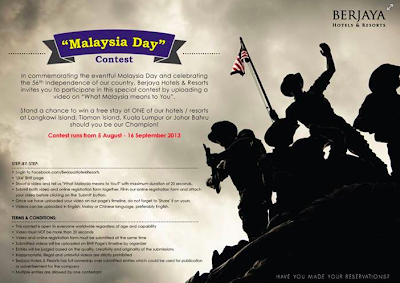 Visit Berjaya Hotels & Resorts Facebook fan page for more details.